A recent attack by Maoists in India raises anxiety ahead of the country’s general elections. It was again a bloody day for the central Indian state of Chhattisgarh. Maoist rebels, popularly known as Naxals, launched another deadly attack on the police that killed 16 paramilitary personnel in the dense forests of the state. According to reports the Naxals triggered bombs at the site where the security personnel were guarding the construction of a road. Around 200 rebels ambushed the patrolling team in the Tongmal area of Sukma district, around 450 km south of the state capital, Raipur. Among the victims are the personnel of the national paramilitary force, called Central Reserve Police Force (CRPF), and some state security officials. Sources say that the extremists looted arms and ammunition before disappearing back into the jungle. In the same area last May, the Maoists eliminated the top rung of the state Congress leadership when the politicians were returning from a political rally. Twenty seven people lost their lives in the first ever attack of its sort in India on members of a political party. In 2010, the left-wing Naxals conducted its most audacious attack by ambushing a CRPF battalion, killing 76 personnel in the Dantewada district of the state. Controlling the dense forest containing precious minerals and natural resources has been a huge challenge for the government for many years. In the absence of proper communication facilities, the jungles of Chhattisgarh have become a graveyard for Indian security forces. Similar to the way Pakistan’s Federally Administered Tribal Areas (FATA) and northwestern areas remain beyond the government control, these jungles in Chhattisgarh elude complete state control. 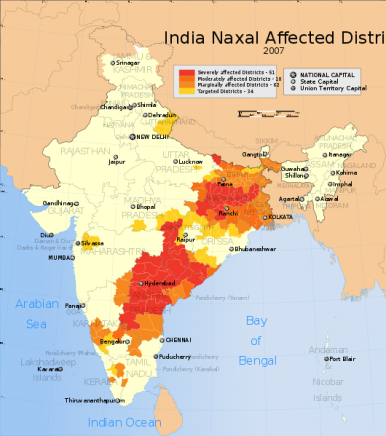 The periodic Naxal attacks across the country reinforces the fact that out of 626 odd districts in India, one third are dominated by the Maoists. A few years ago, Indian Prime Minister Dr Manmohan Singh had termed the Maoists as India’s biggest internal security threat. Over the years government spending on controlling homegrown extremism has been increasing. Despite the creation of a new task force to contain the rising reach of the Naxals, the red corridor in India has been growing every year. It covers seven major states, including Andhra Pradesh, Orissa, Madhya Pradesh, Chhattisgarh, West Bengal, Jharkhand, and Bihar. Interestingly many of these are among the least developed states in India and contain the seeds of much social unrest. Unequal land distribution, government apathy, the absence of basic amenities among the poor, and gradual encroachment of forest lands by big corporations fuel the Maoist rebellion. If one looks at the history of the Maoist movement in India, it has evolved both in terms of its strategy and demands. The rebellion has its origin in the 1960s, starting in a small village in West Bengal called Naxalbari. It started as a struggle against the prevailing feudal system in Bengal and the movement, losing all hopes of acquiring justice from the existing political structure, took up arms to fight for the landless peasants and the voiceless people. Over the years though the method of struggle has remained the same. The Maoists’ demands, however, have gone up. Besides agricultural reform, the Maoists now want tribal ownership over forest land. This is one of the main contentions between the government and the Naxals. The ruling establishment wants to give forest resources to private players for exploitation. The rebels argue that this policy will drive tribes away from their own land and make them pawns in the hands of market players. Therefore, any attempt by the state government to lay roads and improve communication facilities in the forest areas is resisted by the extremists. This has led to violent conflicts in past. Tuesday’s incident is also part of this tussle between the government and the Maoists. The attack comes at a time when the country is preparing to vote in the next parliamentary elections. Security analysts say that the attack is a warning to security personnel that conducting elections in Maoist-infested regions will not be easy.